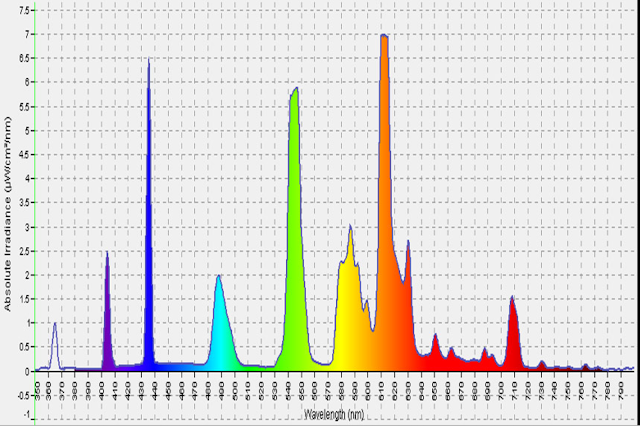 Incandescent light bulbs emit a continues colour spectrum. 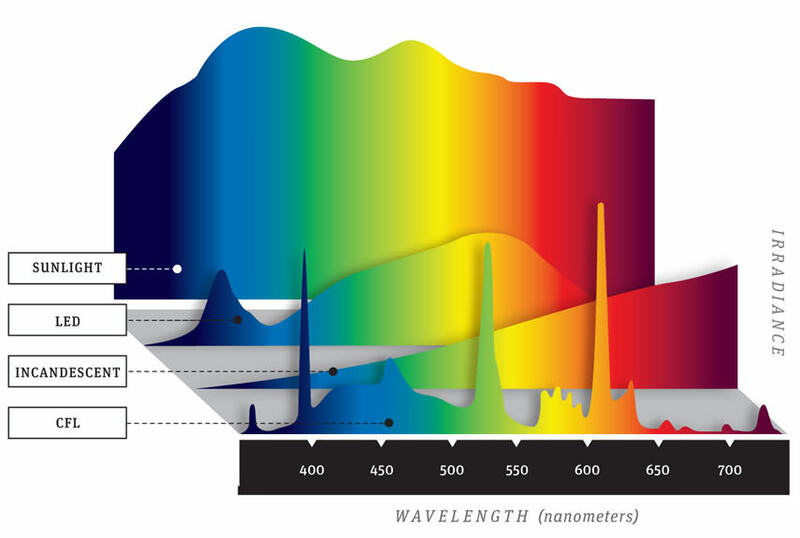 The colours are in the yellow orange range, while fluorescent light emit limited colour bands predominantly in the blue green end of the spectrum. Natural light has a colour spectrum that range from violet to red and has far more colours compared to CFL light. The colour spectrum of daylight at noon or D 55 standard. 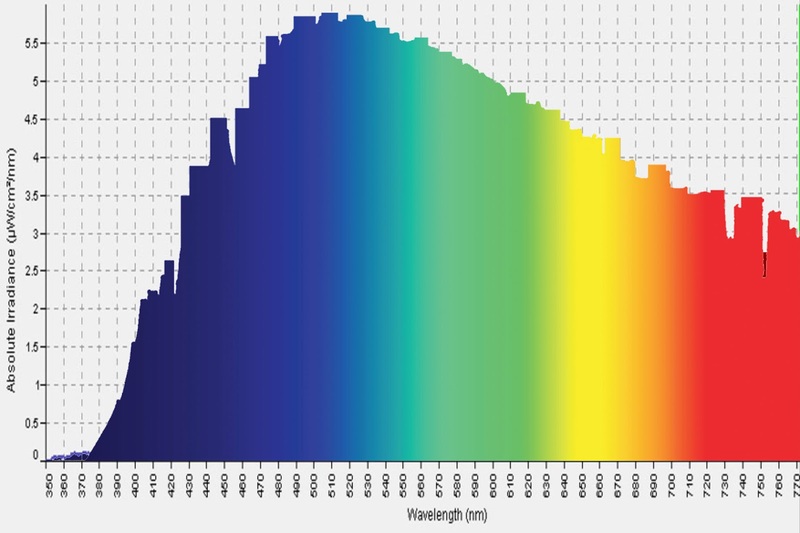 The colour spectrum of a typical Philips incandescent light bulb. Since the colours or energy emitted by CFL is much less than that of daylight the eye can only respond to what”s available. The standard for describing the naturalness of lighting is the Colour Rendering Index (CRI). Daylight is of course the perfect light source, also known as the D55 standard, it has a CRI of 100. Fluorescent light has only CRI 50 at the low end and about CRI 70 of the better quality lamps. The colour of a typical Full Spectrum Philips CFL. closer to daylight. But the light is only a little better but still lack most of the natural colour spectrum. The American magazine Popular Mechanics have made a comparison graphic illustrating the difference in colour temperature of light they tested. Fluorescent light works by electrons emitted from a cathode at the end of the tube at a frequency just outside awareness. Similar to movie films which are still frames presented at a rate of 24 frames a second. We perceive this a motion picture. The flickering is one of the reasons why working or studying in this light leads to eye strain and headaches. Studies shows that fluorescent light account for a 20% drop in academic performance. The flickering is also a factor in onset of ADHD in some children. Children are very sensitive to their visual environment and are disturbed by the flickering as well as the reduced colour spectrum under this light. Each CFL’s contain about 3 mg mercury, so if broken this murky is released into the environment. Think about this, how many fluorescent lights and CFL’s are thrown out every day in the EU or in the US? Where does the mercury go? If the discarded bulbs end up in a landfill it will eventually find its way into the ground water and so on. To set this into perspective, a resent analysis of breast milk on mothers in Australia they found that it contained DDT ( a pesticide that was banned in Australis in 1981 ). Mercury is a heavy metal and is poisonous, even in minute quantities. There is also a problem with the electronics used to make the frequency with which the fluorescent light vibrate. 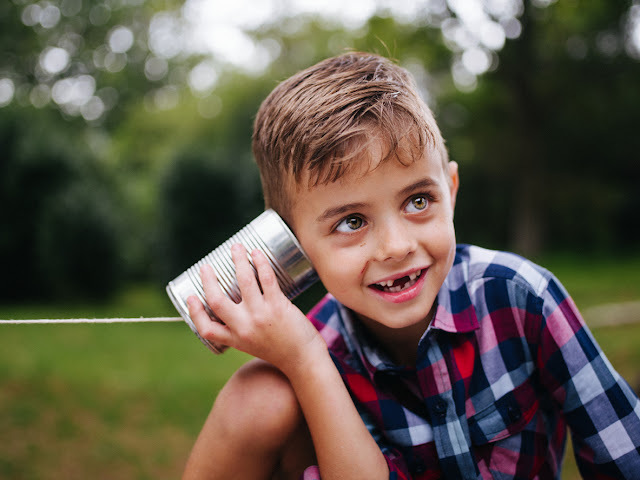 Studies shows that school children achieve better academic results if the electronics at the end of each tube is shielded of with lead. Today, L.E.D. lights can be manufactured so they emit colours at CRI 95, which is very close to the natural light. Currently people do not really know what CRI 95 lighting looks like. You can get an impression next time you pass by a jewellery store. Most likely they will use L.E.D. lighting to emphasis the goldenness of the jewellery. I have even seen rotating L.E.D. lights that makes the diamonds sparkle. More and more restaurants and retailers are using so called smart L.E.D. lights that can control colour temperature as well as brightness. The colour temperature is what makes the light comfortable. The 6,000 K CFL emit light that is too blue at night. The other CFL commonly available is 2,500 K, which emit light that is too yellow. At night our eyes become much more sensitive to blue light. Therefore lighting at night needs to be warmer and less blue. The eye will perceive the colours as normal in daylight. In museums expensive paintings of old masters are illuminated by 2,500 K li an low light environment. Yet the colours appear to be as the master wanted. The warm light is less damaging the the pigments used in the painting. 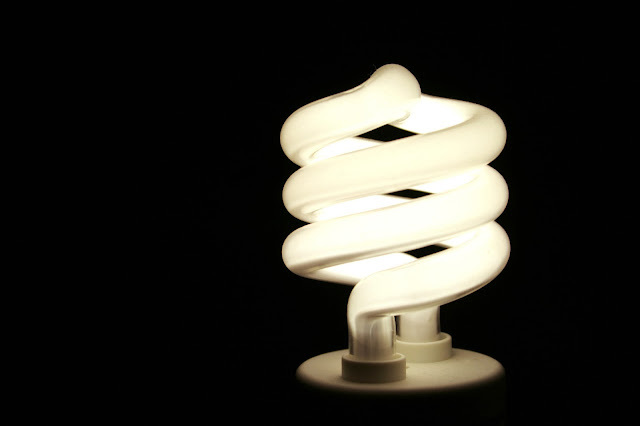 CFL’s and regular fluorescent light tubes emit high levels of blue light. This is what give them the brightness. However, exposure to be light (especially 460 nm ) can overexpose the rod cells in the eyes. Over time that may lead to Macular degeneration and ultimately blindness. Blue light has a higher frequency and therefore the most energy and capacity for damage. When light hurts your eyes it is most likely the blue light part of the spectrum that causes the discomfort.